As educators know, teaching is a complicated practice that requires an interweaving of many kinds of specialized knowledge. In this way, teaching is an example of an ill-structured discipline, requiring teachers to apply complex knowledge structures across different cases and contexts (Mishra, Spiro, & Feltovich, 1996; Spiro & Jehng, 1990). Teachers practice their craft in highly complex, dynamic classroom contexts (Leinhardt & Greeno, 1986) that require them constantly to shift and evolve their understanding. Thus, effective teaching depends on flexible access to rich, well-organized and integrated knowledge from different domains (Glaser, 1984; Putnam & Borko, 2000; Shulman, 1986, 1987), including knowledge of student thinking and learning, knowledge of subject matter, and increasingly, knowledge of technology. Teaching with technology is complicated further considering the challenges newer technologies present to teachers. In our work, the word technology applies equally to analog and digital, as well as new and old, technologies. As a matter of practical significance, however, most of the technologies under consideration in current literature are newer and digital and have some inherent properties that make applying them in straightforward ways difficult. Most traditional pedagogical technologies are characterized by specificity (a pencil is for writing, while a microscope is for viewing small objects); stability (pencils, pendulums, and chalkboards have not changed a great deal over time); and transparency of function (the inner workings of the pencil or the pendulum are simple and directly related to their function) (Simon, 1969). Over time, these technologies achieve a transparency of perception (Bruce & Hogan, 1998); they become commonplace and, in most cases, are not even considered to be technologies. Digital technologies—such as computers, handheld devices, and software applications—by contrast, are protean (usable in many different ways; Papert, 1980); unstable (rapidly changing); and opaque (the inner workings are hidden from users; Turkle, 1995). On an academic level, it is easy to argue that a pencil and a software simulation are both technologies. The latter, however, is qualitatively different in that its functioning is more opaque to teachers and offers fundamentally less stability than more traditional technologies. By their very nature, newer digital technologies, which are protean, unstable, and opaque, present new challenges to teachers who are struggling to use more technology in their teaching. Also complicating teaching with technology is an understanding that technologies are neither neutral nor unbiased. Rather, particular technologies have their own propensities, potentials, affordances, and constraints that make them more suitable for certain tasks than others (Bromley, 1998; Bruce, 1993; Koehler & Mishra, 2008). Using email to communicate, for example, affords (makes possible and supports) asynchronous communication and easy storage of exchanges. Email does not afford synchronous communication in the way that a phone call, a face-to-face conversation, or instant messaging does. Nor does email afford the conveyance of subtleties of tone, intent, or mood possible with face-to-face communication. Understanding how these affordances and constraints of specific technologies influence what teachers do in their classrooms is not straightforward and may require rethinking teacher education and teacher professional development. Social and contextual factors also complicate the relationships between teaching and technology. Social and institutional contexts are often unsupportive of teachers’ efforts to integrate technology use into their work. Teachers often have inadequate (or inappropriate) experience with using digital technologies for teaching and learning. Many teachers earned degrees at a time when educational technology was at a very different stage of development than it is today. It is, thus, not surprising that they do not consider themselves sufficiently prepared to use technology in the classroom and often do not appreciate its value or relevance to teaching and learning. Acquiring a new knowledge base and skill set can be challenging, particularly if it is a time-intensive activity that must fit into a busy schedule. Moreover, this knowledge is unlikely to be used unless teachers can conceive of technology uses that are consistent with their existing pedagogical beliefs (Ertmer, 2005). Furthermore, teachers have often been provided with inadequate training for this task. Many approaches to teachers’ professional development offer a one-size-fits-all approach to technology integration when, in fact, teachers operate in diverse contexts of teaching and learning. Faced with these challenges, how can teachers integrate technology into their teaching? An approach is needed that treats teaching as an interaction between what teachers know and how they apply what they know in the unique circumstances or contexts within their classrooms. There is no “one best way” to integrate technology into curriculum. Rather, integration efforts should be creatively designed or structured for particular subject matter ideas in specific classroom contexts. Honoring the idea that teaching with technology is a complex, ill-structured task, we propose that understanding approaches to successful technology integration requires educators to develop new ways of comprehending and accommodating this complexity. The TPACK framework builds on Shulman’s (1987, 1986) descriptions of PCK to describe how teachers’ understanding of educational technologies and PCK interact with one another to produce effective teaching with technology. Other authors have discussed similar ideas, though often using different labeling schemes. The conception of TPACK described here has developed over time and through a series of publications, with the most complete descriptions of the framework found in Mishra and Koehler (2006) and Koehler and Mishra (2008). In this model (see Figure 1), there are three main components of teachers’ knowledge: content, pedagogy, and technology. Equally important to the model are the interactions between and among these bodies of knowledge, represented as PCK, TCK (technological content knowledge), TPK (technological pedagogical knowledge), and TPACK. Figure 1. The TPACK framework and its knowledge components. Content knowledge (CK) is teachers’ knowledge about the subject matter to be learned or taught. The content to be covered in middle school science or history is different from the content to be covered in an undergraduate course on art appreciation or a graduate seminar on astrophysics. Knowledge of content is of critical importance for teachers. As Shulman (1986) noted, this knowledge would include knowledge of concepts, theories, ideas, organizational frameworks, knowledge of evidence and proof, as well as established practices and approaches toward developing such knowledge. Knowledge and the nature of inquiry differ greatly between fields, and teachers should understand the deeper knowledge fundamentals of the disciplines in which they teach. In the case of science, for example, this would include knowledge of scientific facts and theories, the scientific method, and evidence-based reasoning. In the case of art appreciation, such knowledge would include knowledge of art history, famous paintings, sculptures, artists and their historical contexts, as well as knowledge of aesthetic and psychological theories for evaluating art. The cost of not having a comprehensive base of content knowledge can be prohibitive; for example, students can receive incorrect information and develop misconceptions about the content area (National Research Council, 2000; Pfundt, & Duit, 2000). Yet content knowledge, in and of itself, is an ill-structured domain, and as the culture wars (Zimmerman, 2002), the Great Books controversies (Bloom, 1987; Casement, 1997; Levine, 1996), and court battles over the teaching of evolution (Pennock, 2001) demonstrate, issues relating to curriculum content can be areas of significant contention and disagreement. Pedagogical knowledge (PK) is teachers’ deep knowledge about the processes and practices or methods of teaching and learning. They encompass, among other things, overall educational purposes, values, and aims. This generic form of knowledge applies to understanding how students learn, general classroom management skills, lesson planning, and student assessment. It includes knowledge about techniques or methods used in the classroom; the nature of the target audience; and strategies for evaluating student understanding. A teacher with deep pedagogical knowledge understands how students construct knowledge and acquire skills and how they develop habits of mind and positive dispositions toward learning. As such, pedagogical knowledge requires an understanding of cognitive, social, and developmental theories of learning and how they apply to students in the classroom. PCK is consistent with and similar to Shulman’s idea of knowledge of pedagogy that is applicable to the teaching of specific content. Central to Shulman’s conceptualization of PCK is the notion of the transformation of the subject matter for teaching. Specifically, according to Shulman (1986), this transformation occurs as the teacher interprets the subject matter, finds multiple ways to represent it, and adapts and tailors the instructional materials to alternative conceptions and students’ prior knowledge. PCK covers the core business of teaching, learning, curriculum, assessment and reporting, such as the conditions that promote learning and the links among curriculum, assessment, and pedagogy. An awareness of common misconceptions and ways of looking at them, the importance of forging connections among different content-based ideas, students’ prior knowledge, alternative teaching strategies, and the flexibility that comes from exploring alternative ways of looking at the same idea or problem are all essential for effective teaching. 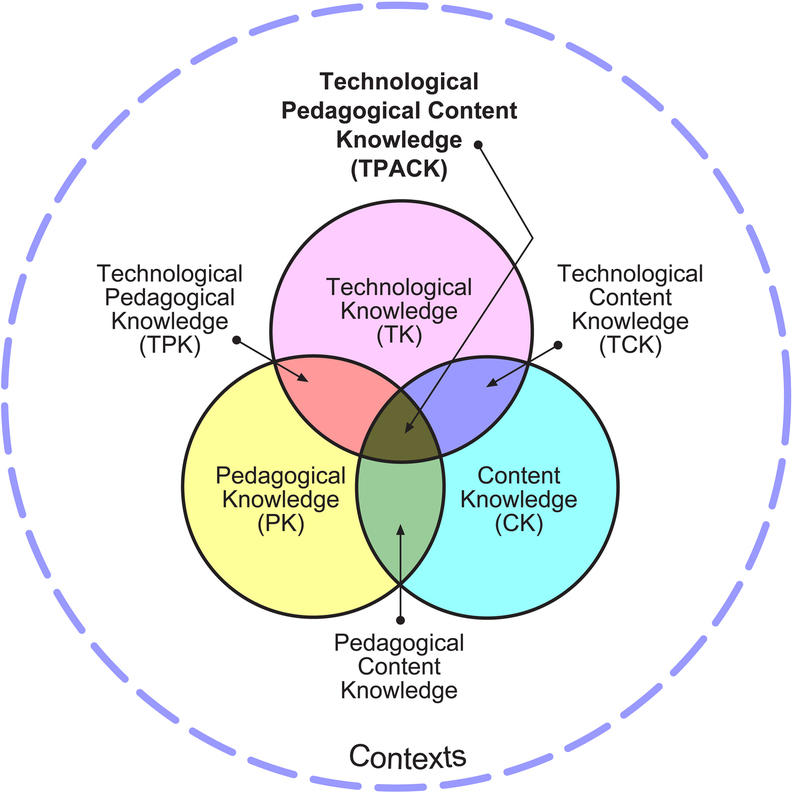 Technology knowledge (TK) is always in a state of flux—more so than the other two core knowledge domains in the TPACK framework (pedagogy and content). Thus, defining it is notoriously difficult. Any definition of technology knowledge is in danger of becoming outdated by the time this text has been published. That said, certain ways of thinking about and working with technology can apply to all technology tools and resources. The definition of TK used in the TPACK framework is close to that of Fluency of Information Technology (FITness), as proposed by the Committee of Information Technology Literacy of the National Research Council (NRC, 1999). They argue that FITness goes beyond traditional notions of computer literacy to require that persons understand information technology broadly enough to apply it productively at work and in their everyday lives, to recognize when information technology can assist or impede the achievement of a goal, and to continually adapt to changes in information technology. FITness, therefore, requires a deeper, more essential understanding and mastery of information technology for information processing, communication, and problem solving than does the traditional definition of computer literacy. Acquiring TK in this manner enables a person to accomplish a variety of different tasks using information technology and to develop different ways of accomplishing a given task. This conceptualization of TK does not posit an “end state,” but rather sees it developmentally, as evolving over a lifetime of generative, open-ended interaction with technology. Technology and content knowledge have a deep historical relationship. Progress in fields as diverse as medicine, history, archeology, and physics have coincided with the development of new technologies that afford the representation and manipulation of data in new and fruitful ways. Consider Roentgen’s discovery of X-rays or the technique of carbon-14 dating and the influence of these technologies in the fields of medicine and archeology. Consider also how the advent of the digital computer changed the nature of physics and mathematics and placed a greater emphasis on the role of simulation in understanding phenomena. Technological changes have also offered new metaphors for understanding the world. Viewing the heart as a pump, or the brain as an information-processing machine are just some of the ways in which technologies have provided new perspectives for understanding phenomena. These representational and metaphorical connections are not superficial. They often have led to fundamental changes in the natures of the disciplines. Understanding the impact of technology on the practices and knowledge of a given discipline is critical to developing appropriate technological tools for educational purposes. The choice of technologies affords and constrains the types of content ideas that can be taught. Likewise, certain content decisions can limit the types of technologies that can be used. Technology can constrain the types of possible representations, but also can afford the construction of newer and more varied representations. Furthermore, technological tools can provide a greater degree of flexibility in navigating across these representations. TPK is an understanding of how teaching and learning can change when particular technologies are used in particular ways. This includes knowing the pedagogical affordances and constraints of a range of technological tools as they relate to disciplinarily and developmentally appropriate pedagogical designs and strategies. To build TPK, a deeper understanding of the constraints and affordances of technologies and the disciplinary contexts within which they function is needed. For example, consider how whiteboards may be used in classrooms. Because a whiteboard is typically immobile, visible to many, and easily editable, its uses in classrooms are presupposed. Thus, the whiteboard is usually placed at the front of the classroom and is controlled by the teacher. This location imposes a particular physical order in the classroom by determining the placement of tables and chairs and framing the nature of student-teacher interaction, since students often can use it only when called upon by the teacher. However, it would be incorrect to say that there is only one way in which whiteboards can be used. One has only to compare the use of a whiteboard in a brainstorming meeting in an advertising agency setting to see a rather different use of this technology. In such a setting, the whiteboard is not under the purview of a single individual. It can be used by anybody in the group, and it becomes the focal point around which discussion and the negotiation/construction of meaning occurs. An understanding of the affordances of technology and how they can be leveraged differently according to changes in context and purposes is an important part of understanding TPK. TPK becomes particularly important because most popular software programs are not designed for educational purposes. Software programs such as the Microsoft Office Suite (Word, PowerPoint, Excel, Entourage, and MSN Messenger) are usually designed for business environments. Web-based technologies such as blogs or podcasts are designed for purposes of entertainment, communication, and social networking. Teachers need to reject functional fixedness (Duncker, 1945) and develop skills to look beyond most common uses for technologies, reconfiguring them for customized pedagogical purposes. Thus, TPK requires a forward-looking, creative, and open-minded seeking of technology use, not for its own sake but for the sake of advancing student learning and understanding. TPACK is an emergent form of knowledge that goes beyond all three “core” components (content, pedagogy, and technology). Technological pedagogical content knowledge is an understanding that emerges from interactions among content, pedagogy, and technology knowledge. Underlying truly meaningful and deeply skilled teaching with technology, TPACK is different from knowledge of all three concepts individually. Instead, TPACK is the basis of effective teaching with technology, requiring an understanding of the representation of concepts using technologies; pedagogical techniques that use technologies in constructive ways to teach content; knowledge of what makes concepts difficult or easy to learn and how technology can help redress some of the problems that students face; knowledge of students’ prior knowledge and theories of epistemology; and knowledge of how technologies can be used to build on existing knowledge to develop new epistemologies or strengthen old ones. By simultaneously integrating knowledge of technology, pedagogy and content, expert teachers bring TPACK into play any time they teach. Each situation presented to teachers is a unique combination of these three factors, and accordingly, there is no single technological solution that applies for every teacher, every course, or every view of teaching. Rather, solutions lie in the ability of a teacher to flexibly navigate the spaces defined by the three elements of content, pedagogy, and technology and the complex interactions among these elements in specific contexts. Ignoring the complexity inherent in each knowledge component or the complexities of the relationships among the components can lead to oversimplified solutions or failure. Thus, teachers need to develop fluency and cognitive flexibility not just in each of the key domains (T, P, and C), but also in the manner in which these domains and contextual parameters interrelate, so that they can construct effective solutions. This is the kind of deep, flexible, pragmatic, and nuanced understanding of teaching with technology we involved in considering TPACK as a professional knowledge construct. This compensation is most evident whenever using a new educational technology suddenly forces teachers to confront basic educational issues and reconstruct the dynamic equilibrium among all three elements. This view inverts the conventional perspective that pedagogical goals and technologies are derived from content area curricula. Things are rarely that simple, particularly when newer technologies are employed. The introduction of the Internet, for example—particularly the rise of online learning—is an example of the arrival of a technology that forced educators to think about core pedagogical issues, such as how to represent content on the Web and how to connect students with subject matter and with one another (Peruski & Mishra, 2004). Teaching with technology is a difficult thing to do well. The TPACK framework suggests that content, pedagogy, technology, and teaching/learning contexts have roles to play individually and together. Teaching successfully with technology requires continually creating, maintaining, and re-establishing a dynamic equilibrium among all components. It is worth noting that a range of factors influences how this equilibrium is reached. We have argued that teaching is a complex, ill-structured domain. Underlying this complexity, however, are three key components of teacher knowledge: understanding of content, understanding of teaching, and understanding of technology. The complexity of technology integration comes from an appreciation of the rich connections of knowledge among these three components and the complex ways in which these are applied in multifaceted and dynamic classroom contexts. Since the late 1960’s a strand of educational research has aimed at understanding and explaining “how and why the observable activities of teachers’ professional lives take on the forms and functions they do” (Clark & Petersen, 1986, p. 255; Jackson, 1968). A primary goal of this research is to understand the relationships between two key domains: (a) teacher thought processes and knowledge and (b) teachers’ actions and their observable effects. The current work on the TPACK framework seeks to extend this tradition of research and scholarship by bringing technology integration into the kinds of knowledge that teachers need to consider when teaching. The TPACK framework seeks to assist the development of better techniques for discovering and describing how technology-related professional knowledge is implemented and instantiated in practice. By better describing the types of knowledge teachers need (in the form of content, pedagogy, technology, contexts and their interactions), educators are in a better position to understand the variance in levels of technology integration occurring. In addition, the TPACK framework offers several possibilities for promoting research in teacher education, teacher professional development, and teachers’ use of technology. It offers options for looking at a complex phenomenon like technology integration in ways that are now amenable to analysis and development. Moreover, it allows teachers, researchers, and teacher educators to move beyond oversimplified approaches that treat technology as an “add-on” instead to focus again, and in a more ecological way, upon the connections among technology, content, and pedagogy as they play out in classroom contexts. Bloom, A. (1987). The closing of the American mind: How higher education has failed democracy and impoverished the souls of today’s students. New York: Simon and Schuster. Bromley, H. (1998). Introduction: Data-driven democracy? Social assessment of educational computing. In H. Bromley & M. Apple (Eds. ), Education, technology, power (pp. 1–28). Albany, NY: SUNY Press. Bruce, B. C. (1993). Innovation and social change. In B. C. Bruce, J. K. Peyton, & T. Batson (Eds. ), Network-based classrooms (pp. 9–32). Cambridge, UK: Cambridge University Press. Bruce, B. C. (1997). Literacy technologies: What stance should we take? Journal of Literacy Research, 29(2), 289–309. Bruce, B. C., & Hogan, M. C. (1998). The disappearance of technology: Toward an ecological model of literacy. In D. Reinking, M. McKenna, L. Labbo, & R. Kieffer (Eds. ), Handbook of literacy and technology: Transformations in a post-typographic world(pp. 269–281). Hillsdale, NJ: Erlbaum. Clark, C. M., & Peterson, P. (1986). Teachers’ thought processes. In M. C. Wittrock (Ed. ), Handbook of research on teaching (3rd ed. ; pp. 255–296). New York: Macmillan. Duncker, K. (1945). On problem solving. Psychological Monographs, 58(5), 1–110. Ertmer, P. A. (2005). Teacher pedagogical beliefs: The final frontier in our quest for technology integration. Educational Technology, Research and Development, 53(4), 25–39. Glaser. R. (1984). Education and thinking: The role of knowledge. American Psychology, 39(2), 93–104. Jackson, P. W. (1968). Life in the classroom. New York: Holt, Rinehart and Winston. Koehler, M.J., & Mishra, P. (2008). Introducing TPCK. AACTE Committee on Innovation and Technology (Ed. ), The handbook of technological pedagogical content knowledge (TPCK) for educators (pp. 3–29). Mahwah, NJ: Lawrence Erlbaum Associates. Leinhardt, G., & Greeno, J.G. (1986). The cognitive skill of teaching. Journal of Educational Psychology, 78(2), 75–95. Levine, L. W. (1996). The opening of the American mind. Canons, culture, and history.Boston: Beacon Press. Mishra, P., Spiro, R.J., & Feltovich, P.J. (1996). Technology, representation, and cognition: The prefiguring of knowledge in cognitive flexibility hypertexts. In H. van Oostendorp & A. de Mul (Eds. ), Cognitive aspects of electronic text processing (pp. 287–305). Norwood, NJ: Ablex. Mishra, P., & Koehler, M. (2007). Technological pedagogical content knowledge (TPCK): Confronting the wicked problems of teaching with technology. In C. Crawford et al. (Eds. ), Proceedings of Society for Information Technology and Teacher Education International Conference 2007 (pp. 2214–2226). Chesapeake, VA: Association for the Advancement of Computing in Education. Pennock, R. (2001). Intelligent design creationism and its critics: Philosophical, theological & scientific perspectives. Cambridge, MA: MIT Press. Peruski, L., & Mishra, P. (2004). Webs of activity in online course design and teaching. ALT-J: Research in Learning Technology, 12(1), 37–49. Pfundt, H., & Duit, R. (2000). Bibliography: Student’s alternative frameworks and science education (5th ed.). Kiel, Germany: University of Kiel. Putnam, R.T., & Borko, H. (2000). What do new views of knowledge and thinking have to say about research on teacher learning? Educational Researcher, 29(1), 4–15. Shulman, L. (1986). Those who understand: Knowledge growth in teaching.Educational Researcher, 15(2), 4–14. Shulman, L. S. (1987). Knowledge and teaching: Foundations of the new reform.Harvard Educational Review, 57(1), 1–22. Simon, H. (1969). Sciences of the artificial. Cambridge, MA: MIT Press. Spiro, R.J., & Jehng, J.-Ch. (1990), Cognitive flexibility and hypertext: Theory and technology for the nonlinear and mutlidimensional traversal of complex subject matter. In D. Nix & R. Spiro (Eds. ), Cognition, education, and multimedia: Exploring ideas in high technology (pp. 163–204). Hillsdale, NJ: Lawrence Erlbaum Associates. The authors contributed equally to this work. We rotate order of authorship in our writing. Dr. Matthew J. Koehler received his Ph.D. in educational psychology at the University of Wisconsin in 1999. He is currently a professor of educational psychology & educational technology at Michigan State University. He has co-authored three books on education and technology, and contributed to 21 books on educational psychology and technology. He has authored and co-authored over 46 published articles. His research focuses on understanding the benefits and shortcomings of new technologies for learning. Famous works involve the development of the TPACK model, which demonstrates the interaction between technology, pedagogy, and content in instructional design. Dr. Punya Mishra is associate dean of scholarship & innovation and professor in the Division of Educational Leadership & Innovation at Arizona State University (ASU). 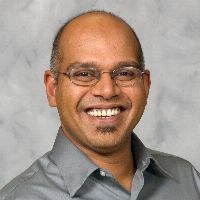 Prior to ASU, Dr. Mishra directed the Educational Technology program at Michigan State University. Dr. Mishra currently serves on the executive council of the Society for Information Technology in Teacher Education, started and served as chair of the creativity special interest group at the Society for Information Technology in Teacher Education, and is the former chair of the innovation & technology committee of the American Association of Colleges of Teacher Education (AACTE). Dr. Mishra is recognized for helping develop (in collaboration with Dr. M. J. Koehler) the technological pedagogical content knowledge (TPACK) framework for technology integration in teacher education.